The HPC "Till-Topper" Organizer is designed to mount on top the HPC-18 Cash Drawer, both are constructed of a heavy welded 18 Gauge metal housing from KRUPP Metals, and are machine formed with exactness and computer precision. 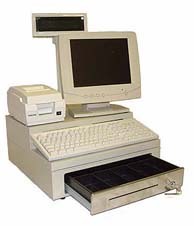 Our "Till-Topper" creates a professional Terminal look, allowing the PC and Pole Display base to be embedded, with the Monitor, Printer, and Keyboard placed on top of the unit. The Till-Topper design eliminates unsightly cabling, and creates a space effective Platform. 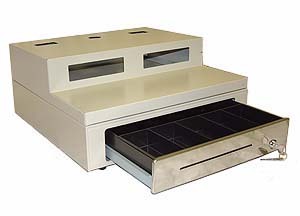 Unlike other mass produced cash drawer organizers, our process ensures exact centerline movement of the drawer. Our passion to produce the worlds best cash drawer organizer has driven us to design a drawer that eliminates side loading, thus reducing wear and extends the life of your cash drawer.